Do you need an LLC operating agreement? You could pay an attorney to draft a custom agreement for you... and that's certainly produce the best document... but at what cost? Yikes. 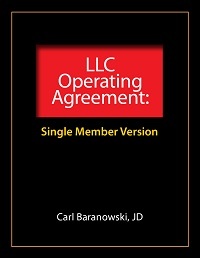 If you need an LLC operating agreement, why not download this simple, sample single member operating agreement. Written by a Stanford Law School graduate Carl Baranowski, it should work as a starter document in many, many situations.